The look of Yahoo mail for web version has been updated. The new look is cool and looks some what like Outlook mail. Preview pan has been added which is a major change. Bluestacks- an emulator which can run android apps, games on Windows 8. Recently Bluestacks released its beta version of its android app player. It also stated that this Android app player will support Mac Os and also previous versions of windows. You can enjoy over 750000 Android apps using this emulator on your pc! Beta version of this software got 5 million downloads. MegaCloud is a free cloud storage service that lets you backup, store, sync and share your photos, music, videos and more with friends across every device. With MegaCloud for mobile you can manage and share your documents, photos, movies and music on the go, easier than ever before. Not only can you share and sync your files across different devices or amongst friends, family and work colleagues but with MegaCloud for Android you can also access your files on the go. Download the MegaCloud apps to get an extra 3GB of storage for FREE! The hackers group, Anonymous, has said it is going to continue its campaign against web censorship in 2013. The group released a statement over the weekend, warning the world to â€œExpect us 2013â€. The group has also released a video featuring its campaign and strikes carried out in the year 2012. The video includes the group’s temporary shutdown of the various US sites in protest of the U.S. government’s indictment of the operators of popular file-hosting site MegaUpload. The video also features the group’s campaign against Syrian government sites over alleged shutdown of the Internet. It also shows Anonymous’ campaign against the Israeli government to protest the latter’s attacks on Gaza. Anonymous had been quite active in India as well in 2012. The group took down various Indian sites to protest ban on file sharing websites. The hackers recently defaced Union minister Kapil Sibal’s website. The wait for Nokia Lumia 920 is withering away as the month of November draws closer. Tagged as the potential savior ofÂ Nokia, the Nokia Lumia 920 has a lot to prove. Nokia may have been the market leader once but those seem to be the times of antiquity. Losing its way, Nokia seemed to have been stuck in a black hole of mediocrity. However, there could be a savior rising from the ashes in the shape of Nokia Lumia 920. Clearly there are reasons to put faith in it. Let us take you through the five reasons why you should look out for Nokia Lumia 920. We are not fond of monopolies and oligopolies popping in the mobile industry. Android and iOS seem to have extended a pretty forceful reign over other OSâ€™s but we feel it is about time that a competitor rose from the ranks and offered something new. Nokia Lumia 920 seems to be just the right candidate so letâ€™s dive into the details of how this phone challenges the competition. As one of the very first smartphones with Microsoft Windows Phone 8 OS, Nokia Lumia 920 is certainly gambling its life on a new OS. This may set a new trend or put you off once and for all. Luck favors the brave, though. And Nokia Lumia 920 certainly earns credit for its courage and guile. We are huge fans of Live Tiles, so it would be really interesting to see how well the highly customizable W8 proposition pans out on a 4.5-inch LCD screen. We recently covered how Nokia refused to be innovative in its methods of operations of late. We alsoÂ wrote how wireless charging was one such amenity that NokiaÂ could have incorporated to stand out among the rest. It seems like Nokia paid heed to what we had to say. Wireless charging with Nokia Lumia 920 takes an interesting course. This is achieved as you place the phone on a Fatboy Recharge Pillow â€“ a wireless charging plate. This frees you from the hassle of plugging your phone in charger providing you convenience at its very best. We are almost always on the lookout for iPhone â€˜killersâ€™, are we not? It looks like we have a challenger with real potential to go up against the mighty Retina Display. Android fanboys often try to cook up tales about how SuperAMOLED is better than Retina. However, in actuality, the display features on Nokia Lumia 920 help it qualify as the only real competitor to date. Firstly, 4.5 inches is a healthy size for a display on Windows 8 phone. You can well imagine how brilliant a view the Live Tiles would be on a spacious screen. We are also pleased by the fact that Nokia has incorporated an IPS LCD that is powered by PureMotion HD+. This particular feature promises to enhance picture clarity and produce crystal clear photos and well-refined videos. You would be pleasantly surprised to know that the display boasts a pixel density of 323 ppi. This might hurtÂ AppleÂ fanboys a little as they fancy boasting about the generous pixel density on the iPhone. Moreover, features like light sensing technology and polarization filter speak for how brilliantly the phone will manage the viewing angles and sunlight legibility. Did we mention it is super sensitive as well? The 8.7 Megapixels camera on the Nokia Lumia 920 is a super star, to say the least. We feel that it is a rare commodity on smartphones these days. Sure, it isnâ€™t as scarce as the 41 megapixels giant on Nokia PureView 808 but we do have our reasons for it. A number of smart features have been incorporated in the camera department. PureView technology along with Floating Lens functionality feature on the Nokia Lumia 920. While the PureView will sharpen the snaps you take, Floating Lens will play the steady cam and offer noise and stutter free results. Most importantly, we are very pleased with how amazingly well the snapper performs in low lighting. Smartphones usually get away with decent photography in daylight but the real test begins in low lighting. The camera prototype tested by The Verge clearly proved that Nokia Lumia 920 is the best in regards to low light photography due to its Optical Image Stabilization. A Dual core Krait processor, clocked at 1.5GHz will keep operations running at a satisfyingly brisk pace. Moreover, the Qualcomm Snapdragon S4 chipset also promises to maintain the flow of tasks. 1 GB of RAM and sufficient storage in 32 GB will also complement it well. Interestingly enough, the Snapdragon S4 chipset is said to help with battery efficiency. Nokia Lumia 920 is lucky to have a Dual core processor on board as this feature is absent on the Quad core variants. Besides, we are certain that the phone possess enough power under the hood anyway. Finally, 2000 mAh battery comes across as the largest on a Nokia smartphone. This goes to show how desperately Nokia is trying to make the Nokia Lumia 920 reap the rewards. With wireless charging as an added advantage, the battery promises to fair well with a bit of assistance from the S4 chipset. Apple posts ‘apology’ to Samsung on U.K. website!! As required by a U.K. court, Apple has posted a notice on its website that says Samsung did not copy Cupertino with its Galaxy lineup of tablets and smartphones. Well, sort of. In the notice, accessible via the “Samsung/Apple UK judgement” link on apple.co.uk, Apple acknowledges that the High Court of Justice of England and Wales found that that Galaxy Tab 10.1, Tab 8.9 and Tab 7.7 do not infringe on Apple’s design patent for the iPad. But those hoping for a mea culpa from Cupertino shouldn’t hold their breath. Apple goes on to toot its own horn and highlight the parts of the judge’s ruling that criticize Samsung’s tablets – particularly that bit about how the Galaxy Tab lineup is “not as cool” as the iPad. Apple concludes by pointing out that judges in Germany and the U.S. have ruled in Apple’s favor on patent infringement cases involving Samsung. Apple did not pen this note out the goodness of its heart, of course. In July, Judge Colin Birss of the High Court ordered Apple to post a note on its website and publish an ad in magazines and newspapers to say that Samsung did not rip off Apple when it designed its tablets. Not surprisingly, Apple was not pleased and appealed the decision, so its public apology was delayed. But the U.K.’s Court of Appeals last week upheld the lower court’s decision. Apple has apparently decided not to take the issue to the U.K. Supreme Court, and posted the notice. The full notice is below. Also check out PCMag’s roundup of Apple’s Most Notable Apologies. Windows 8 available in India, pricing starts at Rs. 699!! Finally, the wait is over. Microsoft has announced the availability of its latest Windows 8 OS for users in India and around the world. Starting today, users can access the latest Microsoft OS on a wide range of Windows 8 PCs, ultrabooks, tablets and hybrid devices. Windows 8 will be available in two versions at retail – Windows 8 and Windows 8 Pro. Apart from buying from the new range of Windows 8 devices, users can also upgrade their current PCs to Windows 8. From 2nd June 2012 until 31st January 2013, users currently running PCs with Windows XP, Windows Vista or Windows 7 are qualified to download Windows 8 Pro for an estimated price of Rs. 1,999. Those who wish to buy a DVD to upgrade will have to pay Rs. 3,499. This offer is valid until January 31, 2013. After that the OS is expected to be priced above Rs. 11,000. Any Windows 7 PCs purchased between June 2, 2012, and January 31, 2013, are also eligible to get a Windows 8 Pro update for an estimated price of Rs. 699 with the Windows Upgrade Offer, available at www.windowsupgradeoffer.com. For business users, Microsoft is offering ‘Windows 8 Enterprise’, which features Windows To Go, DirectAccess, and BranchCache, as well as new security with features including BitLocker and AppLocker. Microsoft has also announced the launch of Windows RT for ARM based tablets, which will only be available pre-installed on new devices. With the Windows 8 launch, the Windows Store is now open for consumers to download apps. Indian users have access to a range of free and paid apps that can be downloaded including Bharat Matrimony, BigFlix, BookMyShow, Bookyourtable, Burrp, Dhingana, Fastrack Tees, Flyte MP3, Gaana, Goibibo, ICICI Bank iMobile, ICICIDirect, JustEat, MakeMyTrip Explore, MapmyIndia, my airtel, PVR Cinemas, Tarla Dalal, Yahoo Cricket and Zovi. As many as 14 OEM partners including Acer, Asus, Dell, Fujitsu, HCL, Hewlett-Packard (HP), Lenovo, RP Infosystems, Sai Info System, Samsung, Sony, Toshiba, Wipro and Zenith Computers will be providing Windows 8-based PCs and tablets in India. According to Microsoft, more than 250 Windows 8-based devices, including 23 brand new SKUs of Windows 8 PCs, will be available in 100 cities and more than 2,500 retail stores in India. The new unit looks just like the old one. It’s the same size and the same weightâ€”I put two next to each other and they were difficult to tell apart except for the new Lightning port on theÂ fourth-gen iPad’s bottom edge. TheÂ new iPadÂ doesn’t need a smaller docking portâ€”in fact, you could argue for a larger plug that’s better able to keep it in place in a dock â€”but Apple’s switching all of itsÂ iOS devicesÂ over to Lightning right now. The difference is inside, in performance. The third-gen iPad had the odd A5X chip, which boosted the device’s GPU without accelerating its CPU at all over the iPad 2. The new iPad has an A6X, which appears to use the brand-new, Apple-designed processor found in Apple’s iPhone 5. That means faster performance. I ran the browser benchmark Browsermark on the new iPad and got a score of 200,333. Compare that to the 126,886 on the previous iPad, and the 191,158 on the iPhone 5, and you see that we may have a significantly faster Web browsing experience here. Apple also boosted the Wi-Fi speeds (invisible) and is offering it on more LTE networks, including Sprint’s (also invisible). The front camera has been upgraded to 1.2 megapixels. So you get the ideaâ€”what we have here is a completely familiar iPad with the same gorgeous high-res Retina screen and 275,000 apps, just faster and a bit better specced. The new model rusticates the third-gen model, making it look like the formerly new iPad was a stopgap in Apple’s cadence of annual releases; perhaps the company was waiting for the A6 to be ready, but needed an iPad for its traditional spring unveiling. Fortunately for third-gen iPad owners, “better performance” is much less visible than “gorgeous Retina screen,” and with the iPad mini now in the running, developers will still be making sure their apps run well on A5 processors. In other words, I didn’t see a huge difference between the fourth-gen iPad experience and that of third-gen iPad here at Apple’s event. That will change over time. The difference will be huge for people able to get the iPad on Sprint LTE, of course, and I suspect the faster Wi-Fi and faster processor will combine to create a notably faster Web-browsing experience. But we’ll have to see that when we do our full review. Another New Apple iPad: The latest Apple iPad looks a lot like the last Apple iPad (a.k.a. the New Apple iPad), which was released mere months ago, and is now discontinued. The changes are mostly internal: a much faster processor, more 4G carriers, and a better front camera. Apple iPad (4th Generation): Side – Apple didn’t mess with the design of its successful 9.7-inch iPad. It’s still 0.37 inches thick and works with existing cases and covers. Apple iPad (4th Generation): Lightning Connector – Apple replaced the older 30-pin dock connector with the new, smaller Lightning port. The iPad doesn’t need to save the space, but Apple needs to nurture a world of Lightning accessories. New (3rd-Gen) Apple iPad and Apple iPad (4th Generation): The third-generation iPad (at left) is no more. It’s been replaced by the nearly identical, but more powerful fourth-generation unit (at right). New (3rd-Gen) Apple iPad and Apple iPad (4th Generation): Edges – The New Apple iPad (now discontinued) and the Apple iPad (4th Generation) seem thin until you compare them to the iPad mini. They’re still very handsome tablets. New (3rd-Gen) Apple iPad and Apple iPad (4th Generation): Backs – Around back, the difference between these two iPads is just that our third-generation iPad is a cellular model, with the plastic antenna covers. Apple iPad (4th Generation): Benchmark – This result probably isn’t valid, as it comes from an iPad that was being manhandled during the benchmark. But even with all that going on, its Web browsing performance beat the third-generation iPad (which scored 126,886) and the iPhone 5 (which scores around 191,000). Most mobile users trust that apps from legitimate, high-profile companies – like banking or shopping apps – will handle their sensitive data with care, but a new study says that even encryption technology might not be enough to secure your favorite apps. Researchers from Philipps University and Leibniz University in Germany examined 13,500 free apps from Google Play and found that about 8 percent contained encryption technology that was vulnerable to “Man in the Middle” (MITM) attacks – where the scammer intercepts data as it travels between the user and its intended target. The researchers picked out 100 apps for manual audit and were able to successfully carry out MITM attacks against 41 of them, despite them being protected by encryption technologies like SSL/TLS. “From these 41 apps, we were able to capture credentials for American Express, Diners Club, Paypal, bank accounts, Facebook, Twitter, Google, Yahoo, Microsoft Live ID, Box, WordPress, remote control servers, arbitrary email accounts, and IBM Sametime, among others,” the researchers said in a paper that described their experiment. Their report did not specify which apps were examined, except to say that they focused on popular apps and those that were perceived as secure. “Instead of malicious apps, we investigate potential security threats posed by benign Android apps that legitimately process privacy-related user data, such as log-in credentials, personal documents, contacts, financial data, messages, pictures, or videos,” the paper said. Researchers concluded that the cumulative install base of apps with confirmed vulnerabilities against MITM attacks was between 39.5 and 185 million users. “This number includes 3 apps with install bases between 10 and 50 million users each,” the report said. Furthermore, researchers conducted an online poll of 754 app users and found that half were not able to correctly judge whether their browsing sessions were encrypted. Google did not immediately respond to a request for comment. But researchers acknowledged that “Android software development and the Google Play Market are relatively open and unrestricted.” Unlike Apple’s App Store, Google does not have an approval process in place, allowing any developer to publish their app on the store. This creates more openness and app options, but can make users vulnerable to spammy or malicious apps. In February, Google unveiled Bouncer, which automatically scans new and existing Android apps as well as developer accounts without requiring an application approval process. It then alerts the developer to possible problems with their apps. Last week, meanwhile, there were reports that Google is developing a built-in malware scanner for Android devices. It appears that Android devices might one day be able to check out the apps you have installed or are going to install on your phone and warn you if it finds something suspicious.!! 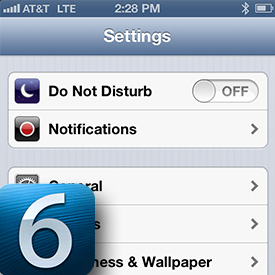 Maybe you’ve installed Apple’s iOS 6, the newest operating system for iPhones, iPad, and iPod touch, but do you know about all the tricks that are inside and how to use them? Apple’s latest mobile operating system, iOS 6, may have sparked a fury of Internet hate for the new Maps app, and I certainly won’t wag my finger at anyone who misses Google’s engine behind the Maps app, but plenty more goodies are tucked away in iOS 6 that you shouldn’t miss. Here are ten of the best features and how to use them. 1. Swipe up to reply to incoming calls with a text message.Â Maybe you heard that when a call comes in, you can now reply with a text message instead of just declining the call. But these options don’t appear automatically. You have to swipe up from the bottom of the screen to reveal them. Settings > Phone > Reply with Message. 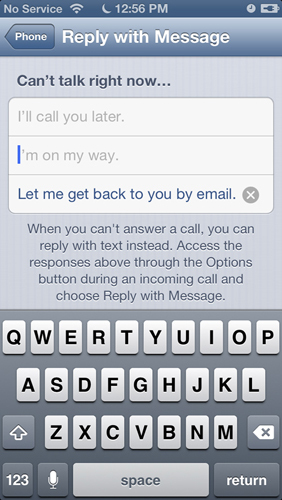 You can now customize your one-touch replies. Settings > Notifications > Do Not Disturb. The Scheduled button lets you define the hours when you don’t want to be disturbed. 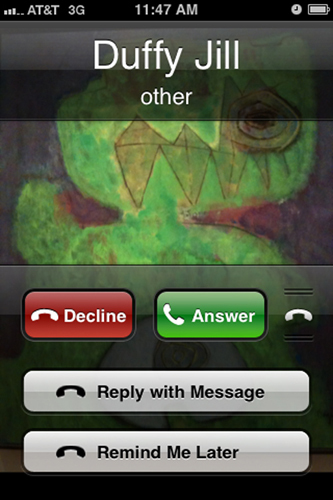 The Allow Calls From button just below it launches a new screen where you can exclude people from your do-not-disturb list. 4. Attach photos and videos to email in the Mail app.Â Formerly, using the mail app was occasionally a pain. You’d compose a message, remember that you wanted to send the recipient a photo, too, and realized you couldn’t actually attach anything to the draft. Now you can. In an email draft, press a hold anywhere in the body. In landscape mode (holding the phone horizontally), list of options will appear, including one to insert a photo or video. If you’re in portrait or vertical mode, just press the arrow button that appears until you see the right choice. 5. 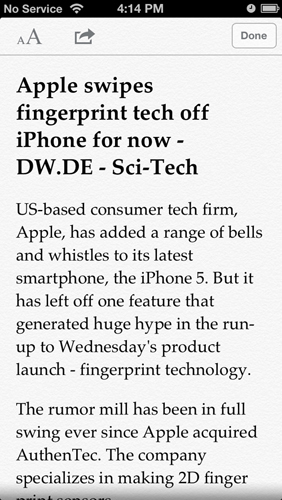 Read in full-screen mode.Â News articles, blogs, and other text-heavy pages, when viewed on an iPhone especially, cause squinting and moreÂ pinching, zooming, panning than most people feel comfortable doing. 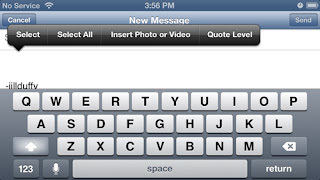 When Safari detects a text-heavy page in iOS 6, it supplies a button called Reader at the top right of the URL bar, which reformats the page in a full-screen and easier-to-read layout. You’ll also notice a “share out” or “send to” button (curved arrow) in Safari with a lot of great option beneath it also worth exploring. They’re mostly not new to iOS 6, but they do appear in a newly designed interface. 6. Pass your iPad or iPhone to friends without worrying they’ll get nosy.Â I admit that I’ve hesitated in the past before passing my mobile devices around to friends to let them look at photos or something that made me giggle on Facebook. The larger the group of friends, the more suspicious I am that someone might take liberties with my device when I’m not looking. The same is true, I’m sure, for parents who let their kids play with their iPhone or iPad. 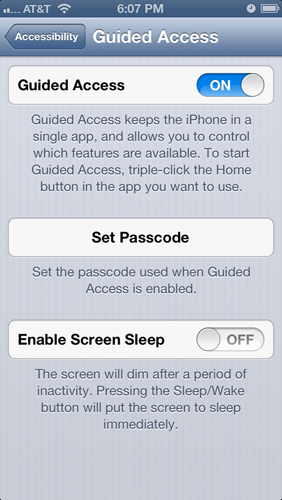 Guided Access, new to iOS 6, lets you lock down your device so that only the app you open can be used, and no other functionality works until you enter a unique four-digit passcode. It’s a little tricky to find and set up. Settings > General > Accessibility > Guided Access. Toggle the switch to on and set a passcode. When you want to use Guided Access, just open the app of choice, and triple tap the home button. Be sure to hit the start button at the top right. But wait, there’s more (see the next tip). 7. Disable buttons in apps (in Guided Access).Â When you enable Guided Access in an appâ€”which locks users from going into any other app or areas of the phoneâ€”you can also disable parts of the screen. For example, if you turn on Guided Access in the Photos app, you can also use your finger to circle parts of the screen you want to disable, such as the top row of buttons so that one can look through your other albums. Just be sure to hit the Start button in the top right corner before handing over your device! 8. 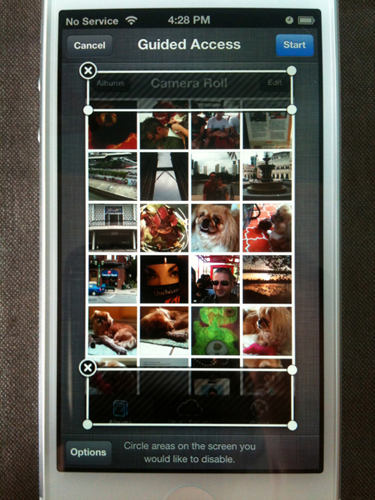 Share Photo Stream.Â Apple’s syncing service, iCloud, handles images with speed and good responsiveness. 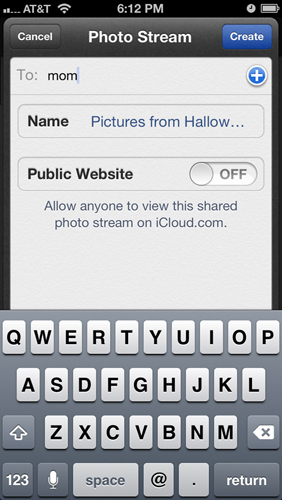 But it was never easy to share your pictures until iOS 6 came along. To share your Photo Stream images, go to the Camera app and press Photo Stream. Then hit the plus button in the upper left, which will open a screen where you can fill information about how to share your Photo Stream, whether with a select few individuals, or by making it public on your iCloud account. 9. Learn what the new Privacy button means (and use it).Â A new Privacy button under Settings comes with little explanation. Tap it, and you might not know what information it’s even telling you because there are no instructions or explainers. Here’s what it does: Privacy shows you apps that can talk to other apps, and whether they are. For example, my Twitter app talks to my Flipboard app. I enabled that integration, and I’m okay with it. But if I didn’t remember allowing it, or wanted to shut it off, I can do so in the Privacy area with one quick motion. This feature gives you very good ability to quick ability to turn off any app-to-app sharing that you don’t want and you might have forgotten existed. So if you don’t want Facebook to know where you are, check the Location Services section of your Privacy buttons, and you can flip the switch off lickety-split. Settings > Facebook > Settings. Of course, you can also add Facebook alerts to your Notification Center, but that feature isn’t new (it’s under Settings > Notifications, and then scroll down until you find Facebook in your list of apps).